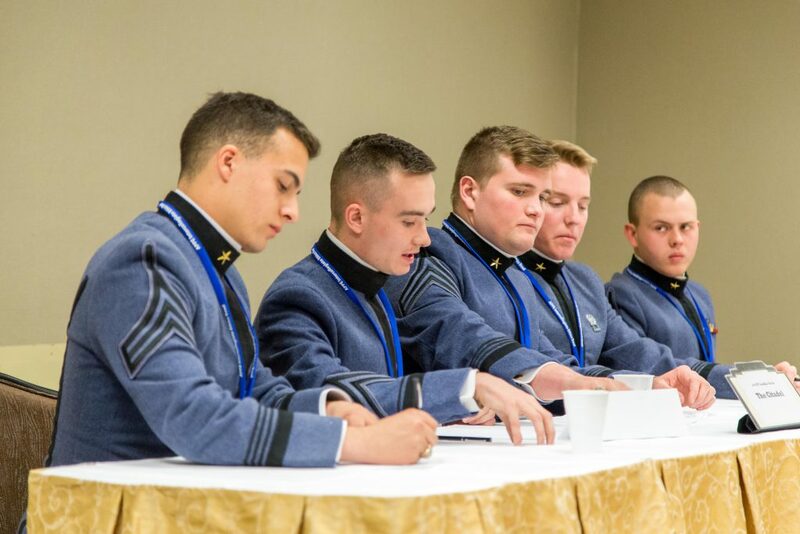 Citadel Cadets at the Ethics Bowl during a presentation. Since Fall 2011, The Krause Center for Leadership and Ethics has sponsored The Citadel’s Ethics Bowl Team. The Intercollegiate Ethics Bowl, sponsored by the Association for Practical and Professional Ethics, consists of a national tiered competition in which hundreds of teams compete each year. Ethics Bowl is a team competition built around thoughtful analysis and dialogue on current ethical issues in business, the professions (engineering, law, research, medicine, etc. ), and public life. Team members learn to engage with the ethical issues of each case, learn to acknowledge diverse perspectives and how to explore alternative points of view. In an Ethics Bowl competition, all sides of a controversial issue are explored and teams are expected to listen and respond respectfully to questions and comments.Ethics Bowl achieves a level of authentic discussion on controversial issues that is second to none. Participants build their critical thinking and moral reasoning skills while demonstrating effective civil discourse.